Rule of 3’s teach us that you can only survive 3 days without water. Prepping for locally affected/short recovery threats doesn’t require much water. However, what if you are trying to prepare for a more extreme threat like a collapse that could have a longer recovery time? This is especially challenging if you live an apartment where you have a limited amount of storage space. In that case we must consider how to store emergency water supply in an apartment. 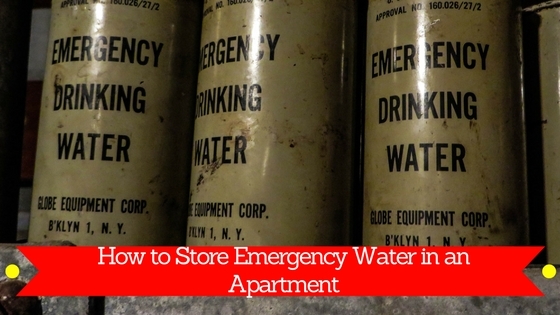 In this week’s episode Magaret has a question about prepping in an apartment but more specifically how to store emergency water supply in an apartment. Being that I am also an apartment prepper I can definitely relate. So I wanted to share some ideas that I have used personally and other ideas that I have found from other prepper communities. Use Smaller Soda bottles like 2 liters to take advantage of smaller spaces in your cupboards and other areas like under the bed, the floor of your closet, etc.